Thirty one International Canoes visited Loch Lomond Sailing Club for the Europa Cup combined with the UK National Championship. The magnificent hospitality of the host club and superb race management of PRO Fergus Duncanson and his team more than compensated for the weather which varied from a sunny calm on the penultimate day of the series, resulting in no racing that day, to a very windy long distance race. 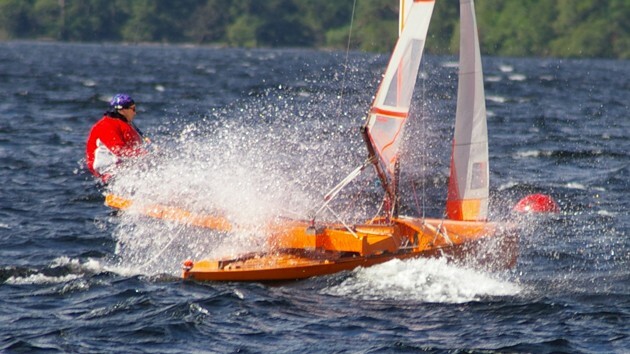 The results list shows who was at the front of the action but fails to capture some of the highlights, such as the long distance race on day two round several of the islands on the Loch which had to be shortened slightly when the wind reached 26 knots. 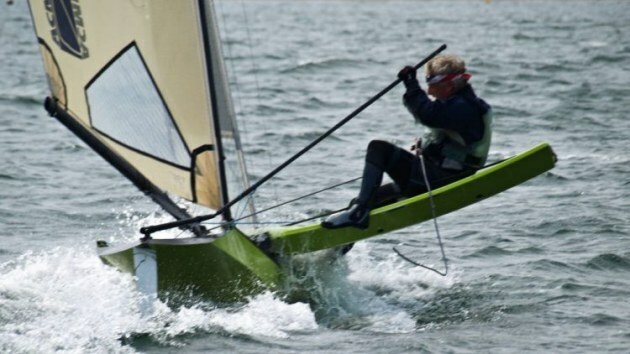 These conditions suited John Robson who won the Murphy Howard Cup in the Asymmetric Canoe and Simon Allen who just held off the challenge from John Ellis in the standard International Canoe to win the Sailing Challenge Cup (dating from 1875, the oldest trophy in any class of dinghy). 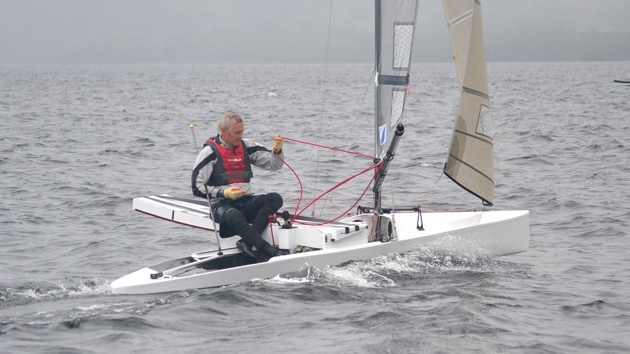 Steve Bowen suffered a broken mast, putting an end to his Championship, and Ian Hibbitt broke his carriage: however it was repaired and in use again the next day, but it couldn't withstand a collision on the final day. 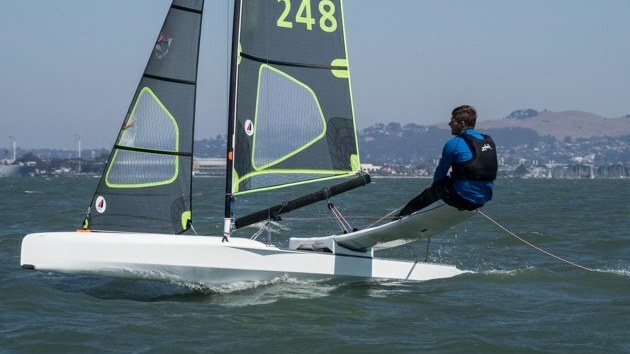 On the Asymmetric Canoe windward/leeward course Robin Wood was dominant with four firsts and two seconds, but should the Welshman falter his son Ben was ready to take over, with father and son first and second in race two. By finishing sixth overall and one place ahead of the first visiting European, Tobias Kunz from Germany, Ben Wood's novitiate in the class is clearly over. Along with John Robson, Class Chairman Gareth Caldwell was the only other sailor to beat Robin in two races. Class Secretary Andy Biden had his moment of glory, all but leading the fleet for much of race six. Registrations Secretary Phil Allen and Chief Measurer Colin Brown were consistently in the top five, with Colin the reluctant winner of the AC 'Old Man's Trophy' as the best of the over 55s. The equivalent Vintage Trophy in the International Canoes went to Colin Newman: he says it gets easier to accept when your name is on the walking stick six times already! In the standard International Canoe fleet which sailed a triangle/sausage course only the Swede Johan Elfstr�m from among the visitors from continental Europe and Colin Newman briefly interrupted the two-man match racing for first and second place between Simon Allen and John Ellis. 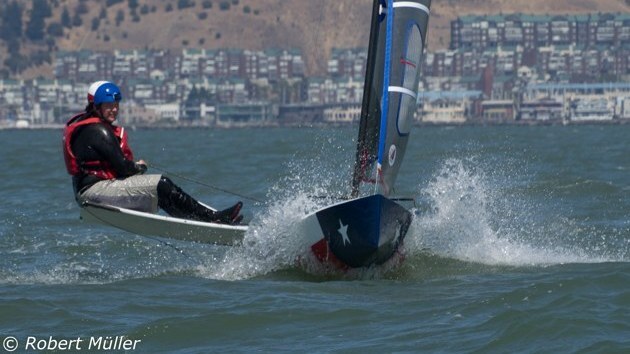 If it had not been for a capsize when leading in the final race the championship would have been won by John. However honours went to Simon Allen, who acknowledged his good fortune as he won the Europa Cup for his third time and retained his UK National Champion title, leaving John Ellis as runner-up and with the Veterans Bowl as a consolation prize for the older man. 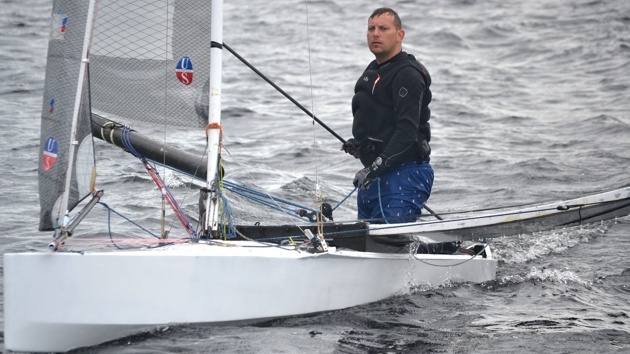 Local man, Paddy Adler won the UK Novices Trophy and Mike Shreeve the first Classic IC trophy. Only one Development Canoe, that of Alistair Warren, raced with the ICs: it was faster in the light stuff but after a windy race it had to have some strengthening, aided by some mahogany from the club's skip. It is not the winning but the taking apart that matters! For the record, Alistair was fourth, fifth and first over the line in the IC fleet, with his remaining 4 results being DNF or DNC. As with all major IC events, the social life was very important, and this side of things was well looked-after, with an informal meal on Sunday evening to show the visitors where Doug's Pub was, a barbeque on Monday, a visit to Glengoyne Distillery on Tuesday, a Scottish-themed evening on Wednesday which included an excellent meal (complete with a miniature of malt whisky for all attendees) followed by a ceilidh with Scottish Country dancing. The Championship Dinner on Friday followed the prize-giving, and there were good breakfasts at the club every morning for those up early enough. Thanks must go to the event sponsors: Stirling Sports Council, Glengoyne Distillery, MacSween Haggis and Tunnocks, all of whom enabled the social events to reach their high standards and to keep the cost down.